Reser bara 25 minuter utanför Valencia till ett hemland, och gå på denna verkstad för att lära dig hur man gör paella och sangria. Med din transport till och från Valencia planerad till dig, är allt du behöver för att vara redo att ha det bra. 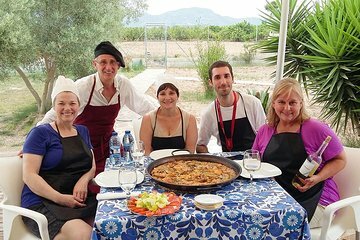 Din guide kommer att gå igenom varje steg i paella och sangriaberedningen med dig, så du kan bli bekant nog att göra den igen en gång hemma igen. När maten är beredd, njut av att äta den tillsammans med andra godsaker som hemlagad tårta. My husband, friend and I decided to do this workshop when our ship was docked in Valencia. It was a great decision! We had a wonderful day learning how to make Paella and Sangria. Our hosts were so welcoming and made our day so special. We felt we were visiting friends and felt at home as they made us feel that we were their friends forever. Also the food and drinks they gave us were wonderful. We met people from Britain and we had a ball with them. If you are looking for a special thing to do that you will remember forever - do this Paella and Sangria workshop! You will be so happy that you did! We loved this workshop, the staff was very engaging and the food was great! (Hope my husband and I can re-create the paella at home.) And the other folks who had signed up for this workshop were also very interesting to talk to as we ate dinner together.